Summer is fading here. Soon, the berries will give way to the squash, the melons to the root vegetables and the white wine to the red. As much red wine as I enjoy, I will miss the fresh, crisp, acidity and minerality of some summer whites. My recent example is another of Italy’s whites: Friulano. Like so many other Italian whites, (See earlier posts on Vietti Roero Arneis, DeAngelis LaCrima Christi del Vesuvio, (Bibi Graetz) Cicala del Giglio and Feudi di San Gregorio Greco Di Tufo) this grape produces wine of joy and easy drinking at budget friendly prices. Friulano was known as “Tocai Friulano” which caused some confusion with Hungary’s Tokai. In March of 2007 that confusion ended with an earlier agreement between the European Union and Hungary and the wine today is simply known (or should be) as Friulano. The area of the Adriatic where these grapes are grown includes Slovenia (where the grape is known as Sauvignonasse). And you may know it also as Sauvignon Vert from Chile and elsewhere. But if you believe in terroir, you believe too that where the grape is farmed makes a difference. 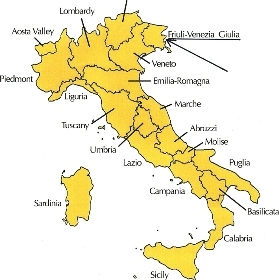 specifically in the Friuli-Venezia-Giulia region, in the Colli Orientali del Friuli appellation (D.O.C.). The winery has 70 acres under production, producing several wines and its star white is Friulano (Free-oh-LAH-no) “Adriatico.” Bastianich may be a “celebrity” winery but it is very serious in its commitment to producing excellent wine as evidenced by some of its wines having earned the Tre Bicchieri Award from Italy’s Gambero Rosso guide. Joe Bastianich himself was not too famous in his own mind during his twenties to avoid working in the vineyards of Friuli-Venezia-Giulia. a pleasing floral nose accented strongly with tree fruit. The taste offers peach. I enjoyed a definite taste of ripe pear. The finish offers almond and, for me, a hint at lemon. The wine is crisp, clean yet gives a very lush mouth feel that is very rewarding for a white and finishes in perfect acidity and minerality throughout the experience. That’s a lot of experience for $14 a bottle! 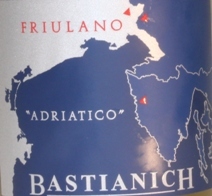 Bastianich Friulano “Adriatico” is 100% indigenous Friulano, steel fermented to preserve fruit and freshness and accomplished without excess acidity that sometimes is evident (my opinion) in some steeled Chardonnays that are produced without malolactic fermentation. Not only is the enamel on your teeth safe with this wine, your mouth will feel refreshed. Bastianich undergoes 30% malolactic fermentation and the must rests 7 months on its lees with frequent batonnage (pump over). The result is a smooth, rich, lush white wine. & French, goat-Feta cheese with fresh oregano. This is a perfect summer wine, an outdoor pleaser if you have a gathering and an excellent wine for wine “geeks” to huddle over and discuss. It’s super food friendly and versatile. 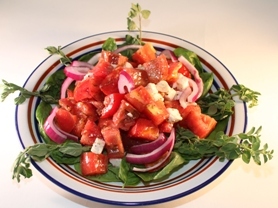 Serve it with a cheese plate appetizer. Enjoy it with smoked salmon. 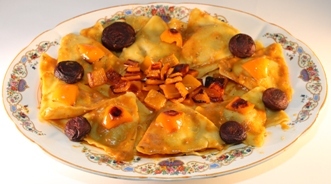 It would do well with spicy foods, or most any seafood (depending on how sauced) or veal. Prosciutto? Absolutely. Take a step back in time, wrap some around a melon piece and enjoy them together. I made some porcini mushroom and truffle ravioli glazed in a light cream-pumpkin sauce with roasted organic orange bell pepper and an heirloom tomato salad. The Bastianich Friulano elevated the whole experience. I find that I most appreciate wines that reflect their terroir and give me a sense of place, and grapes that are handled so as to retain their characteristic identity throughout the process of becoming wine. It’s a travelogue you can inexpensively enjoy without leaving the kitchen table. Today, when some old-world wine is becoming more new world through technique, good “travel agents” are to be appreciated. My thanks to winemaker Emilio de Medicio and the Bastianich family for making this “trip” available. This wine best enjoyed within a few years of harvest.